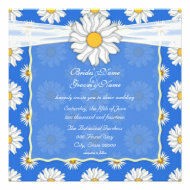 Looking for some great daisy wedding invitations? 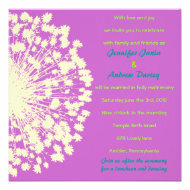 I have found a lovely selection of daisy invitations for you that will accentuate your special day really well. There’s something really beautiful and simple about the daisy – it’s white petals (that we’ve all plucked off as young girls wondering if ‘he’ loves us or not) and it’s sunny yellow centers are just the epitome of innocence that is captured in the romantic white wedding fairy tale that we dream our wedding day is going to be. 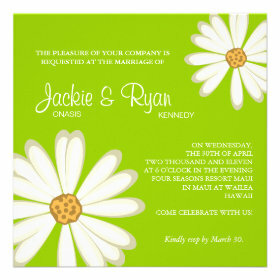 Who wouldn’t want to incorporate daisies into their wedding theme? Daisies look great with a wide number of colors which is another reason why they are a great theme idea for any wedding, so let’s have a look at some of the great daisy wedding invites that I’ve compiled here for you. 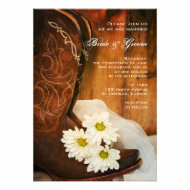 Daisies add a lovely simplicity to a country themed wedding and are the perfect flower to use. Think of meadows sprinkled with daisies growing free and you’ve really captured a carefree, country childhood moment. I actually love to see the bridal party wearing daisies in their hair as there’s just something really gorgeous about the look. There’s something about the color black which can often add an aura of sophistication to something and when you combine the simplicity of the daisy with the sophistication of the color black you end up with a very elegant choice of wedding invitations. The yellow helps to add brightness to the black giving it a more festive feel and white …… well white always looks good at weddings! The way you combine the colors create a totally different ‘look’ which is really well illustrated with the first two of these invites – the first would look great at a sophisticated affair while the second would be gorgeous in a more relaxed or garden style wedding. When you add some grey into the mix you get another style of daisy wedding invitation and I must admit this is far from my favorite type of daisy invite, but we’re all different and I know there are a lot of people who would love to add grey into their daisy wedding color scheme especially as it’s a very hot bridal color this season. 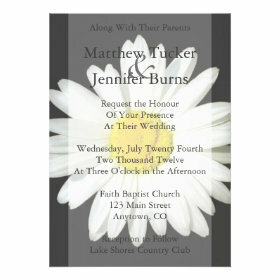 Cream is another color that combines well with black and daisies and adds a whole new dimension in sophistication as you can see from this last daisy invitation. The ultimate in a simple daisy wedding invitation is simply to use the daisy and nothing else which is where these invitations are complete stand outs. 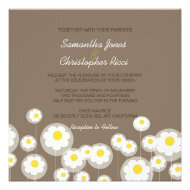 Using just the white and yellow of the daisy makes this wedding invitation really shine, don’t you think? If that invitation doesn’t quite do it for you then what about this next one which is simply a close up image of a daisy and simple black lettering on the invitation. 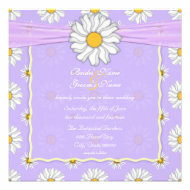 An awesome daisy invitation that would be perfect for any spring or summer wedding. 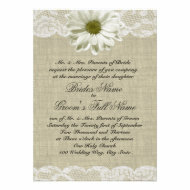 The freshness of green goes so well with daisies that it’s a good color combination to go with and the best thing about it is any shade of green seems to go well with the white and yellow of the daisy as you can see with these three daisy wedding invitations – they all use a different shade of green and pull of a gorgeous look really well. Blue is a beautiful color to add to a daisy theme – in some cases it can evoke thoughts of a summer sky and remind you of summers making daisy chains and relaxing in meadows without any cares in the world. Daisies also look good with darker blues like navy for a more sophisticated look. 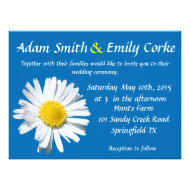 Whatever blue is your favorite if you want to incorporate daisies with it you just know it’s going to look sensational – here’s a few wedding invitations to illustrate my point. Daisy wedding themes are one of the themes that can cross over and be used in vintage weddings, retro weddings or even contemporary weddings which is no mean feat! Daisies have been written about and sung about for years and are still loved by many so it really shouldn’t be that much of a surprise. There are a number of different vintage designed daisy invites available, but here’s just three that I’ve selected to show you (personally I like the lace one best). Daisies are such simply flowers that they are often given the ‘retro’ treatment in art and the same goes with wedding invitations so if you’re going for a retro feel wedding, a flower power ceremony or just want to have a little fun you’ll love these retro style invites. Lots of Colors Look Good With Daisies! 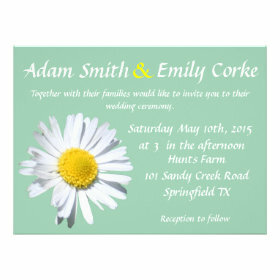 Choose your favorite wedding color combination and you’ll find that the humble little daisy will be a great compliment to it as you can see with these gorgeous daisy wedding invitations. Whether you want a pink wedding, an orange wedding or any wedding inbetween you can be sure that the daisy can be incorporated into your wedding in some way. This entry was posted in Uncategorized on June 19, 2015 by Lou.